The $47bn takeover of NXP and Freescale by Qualcomm by the end of the year is a bombshell for the embedded industry. Both NXP and Freescale have major focus on embedded while Qualcomm has not - the main angle is the cellphone and networking business. While the move will push Qualcomm into the automotive electronics business, there are signficant risks to the embedded divisions. NXP also has leading positions in automotive infotainment, networking and safety systems, with solutions designed into 14 of the top 15 infotainment customers in 2016 but also serves more than 25,000 customers through its direct sales channel and global network of distribution channel partners. The deal is largely financed by Qualcomm's offshore cash to avoid US taxes. Qualcomm says the transaction is structured to enable tax efficient use of offshore cash flow to rapidly reduce leverage. The combined company is expected to have annual revenues of more than $30 billion, addressable markets of $138 billion in 2020 and leadership positions across mobile, automotive, IoT, security, RF and networking. Qualcomm sees complementary technology leadership in strategically important areas such as general purpose and automotive grade processing, security, automotive safety sensors and RF, as well as mobile SoCs, 3G/4G modems and security. In networking the new company would be a leader in network processors for wired and wireless communications and RF sub-segments, Wave-2 11ac/11ad, RF power and BTS systems. Costs will also be slashed. Qualcomm expects to generate $500m a year in savings in the first two years. Sierra Wireless has launched modules for Category-M1 (Cat-M1) and Category-NB1 (Cat-NB1) LTE networks supporting the 3GPP standard for low-power wide-area (LPWA) technologies, which was designed specifically to enable new IoT services. For businesses developing IoT applications for markets such as energy, transportation and smart cities, Sierra Wireless’ LPWA solutions will simplify wireless integration and system development with cloud-connected modules, lower the cost and power consumption of devices and enable reliable and resilient connectivity links for locations with coverage challenges, such as deep indoors and in rural areas. Sierra Wireless AirPrime HL and WP Series modules are the smallest embedded modules (22 x 23 mm) to be completely interchangeable across 2G, 3G, 4G and LPWA technologies. They use the CF3 form factor, which is footprint compatible across product lines, providing customers with the option to develop smarter by building their connected IoT product or service on a single module. The AirPrime CF3-based Cat-M1 and Cat-NB1 cellular modules are fully compliant with the 3GPP Release 13 standard. The HL Series for the LTE Cat-M1 air interface is in carrier trials now and sampling with lead customers. The HL Series for the LTE Cat-NB1 air interface is in development now and will be trialing with carriers soon. The WP Series will be available in 2018. The ALT-120 from Sony-owned LTE chipset provider Altair Semiconductor is being used in the first commercial roll out of the LTE-M network for the Internet of Things (IoT) in the US. The ALT-1210 is one of the first chipsets supporting LTE Cat-M connectivity, and the first to enable Cat-M devices on an LTE-M enabled commercial site, which was launched in support of the pilot of AT&T's LTE-M Low-Power Wide-Area network at the AT&T Labs in San Ramon, California. Similar to its ALT-1160 Cat-1 predecessor, the ALT-1210 enables greater than 10 years of battery life, and featuring Release 13 Cat-M extended coverage and IoT-optimized throughput, provides a lower cost, higher performance solution than proprietary LPWA solutions. "The Altair ALT-1210 chipset enables the future of IoT today, providing low-cost and low power LTE connectivity for a range of industrial and consumer IoT applications," said Cameron Coursey, Vice President of Product Development, Internet of Things Solutions at AT&T. "We are pleased to extend our strategic cooperation with Altair, leveraging our first-to-market LTE-M enabled site." "We are very excited to be working with AT&T to enable future advances in the IoT ecosystem and North America's first Cat-M enabled commercial site," said Eran Eshed, Co-Founder and VP of Worldwide Sales and Marketing for Altair. "Altair has a long history of innovation and first-to-market LTE chipsets solutions; in that sense we find a very synergistic relationship with AT&T." Samsung has teamed up with Silicon Labs on wireless modules targeting battery-powered edge nodes for the Internet of Things (IoT). 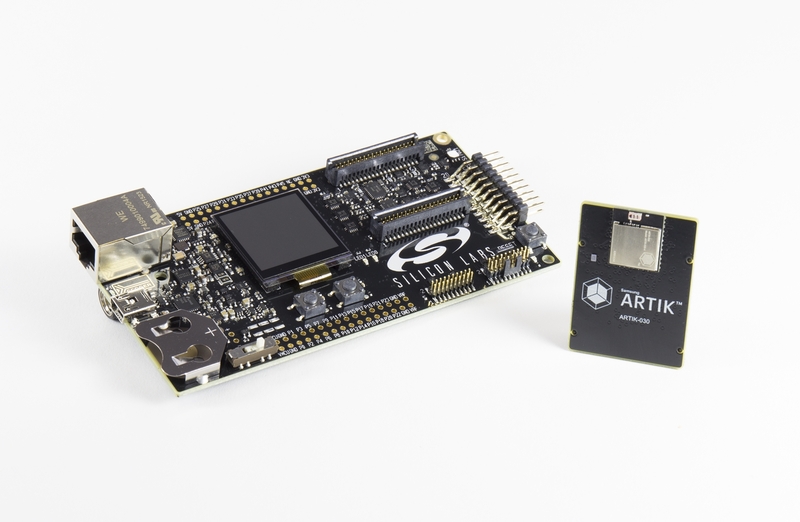 The new SAMSUNG ARTIK family is based on Silicon Labs’ low-power, multiprotocol Wireless Gecko system-on-chip (SoC) platform based around the ARM Cortex-M4 processor core. The SAMSUNG ARTIK 020 module includes Silicon Labs’ Bluetooth low energy software stack, and the SAMSUNG ARTIK 030 module uses Silicon Labs’ ZigBee and Thread mesh networking stacks. The small-footprint modules (13 mm x 15 mm) are ideal for space-constrained applications and integrate all essential components including the antenna to simplify the RF design process. The SAMSUNG ARTIK platform is a fully integrated chip-to-cloud solution that helps IoT developers accelerate their product development process, reduce time to market and improve total cost of ownership for their IoT products. The platform provides security from device to hub to cloud to data management. The SAMSUNG ARTIK platform provides the essential hardware, software, tools and SAMSUNG ARTIK Cloud building blocks for development of new enterprise, industrial and consumer applications. Developers can focus their expertise on designing new applications and services rather than building entire systems from the ground up, enabling faster time-to-market. "Silicon Labs is delighted to collaborate with Samsung in developing new, best-in-class wireless modules, enabling developers to accelerate delivery of secure, interoperable and intelligent IoT products and services," said Dennis Natale, Vice President of IoT Business Development at Silicon Labs. "As Samsung's first certified partner for the SAMSUNG ARTIK module, we are impressed by the strength of the rapidly growing partner ecosystem for the SAMSUNG ARTIK platform and excited about the opportunity ahead. We look forward to helping Samsung deliver on its vision of providing a robust, horizontal IoT platform that includes all of the hardware, software, security and cloud-based technology necessary to meet the needs of diverse customers." More information about the SAMSUNG ARTIK platform and development tools can be found at https://developer.artik.io/. For more information about Silicon Labs’ IoT connectivity technology, visit http://www.silabs.com/wirelessgecko. The race to get new internet-connected products to market and jump on the IoT bandwagon is compromising security and putting customers’ personal data at risk, say security researchers at Context Information Security. Recent news has shown the potential repercussions for easily hacked IoT devices, being used for a botnet that has been used to bring down sections of the Internet, and is up for hire to allow online criminals to make further DDOS attacks. Context researchers have themselves exposed security flaws in a number of IoT products including Wi-Fi lightbulbs, a Canon printer, aYale smart alarm and Motorola home security cameras. In each case the vendor was informed and Context helped to fix the vulnerabilities. Chinese chip designer Espressif Systems has licensed and deployed the RivieraWaves Bluetooth dual mode technology in its new ESP32 chip for nodes in the Internet of Things. Espressif is headquartered in Shanghai and is developing chips for low cost wireless connectivity in a wide range of products. The new ESP32 combo chip integrates robust wireless interfaces for 802.11b/g/n Wi-Fi and CEVA’s Bluetooth 4.2 dual mode, along with GPIO for system flexibility. Designed for ultra-low power consumption, the ESP32 is aimed at mobile devices, wearable electronics and the IoT. “The IOT is a rapidly growing set of fragmented and multi-faceted applications. The combination of Wi-Fi and Bluetooth offers the best user experience, covering a wide range of use cases." said Teo Swee Ann, CEO of Espressif Systems. "We have chosen CEVA's RivieraWaves dual mode Bluetooth IP because it allows us to address the widest possible range of applications, covering both classic and low energy connections. We are delighted with the quality and excellent technical support, which enabled us to rapidly integrate Bluetooth capabilities into Espressif's ESP32 platform." The RivieraWaves Bluetooth IP platforms consist of a hardware baseband controller, plus a feature-rich software protocol stack. A flexible radio interface allows the platform to be deployed with either RivieraWaves RF or various partners’ RF IP, enabling optimal selection of foundry and process node. For wireless headset / earbud applications, the RivieraWaves Bluetooth 4.2 dual mode controller, modem and TSMC 40nm radio are an ideal fit and can be further augmented with a low power CEVA audio/voice DSP for noise/echo cancellation, always-on voice activation or other proprietary audio enhancements.